Yes it's me, your local inactive b*tch!!!!!! This is so extremely late. School, SATS, and portfolio work probably take up all my time about now. But this past summer was probably one of the best ones of my life, so I really was too distracted to realize that I was being very inactive. Oh well. So obviously, this is a drink and not food, but this was an Icelandic orange soda. I had to commemorate it because it was the first thing I had when I got to Reykjavik. It was at the Harpa Museum restaurant. Highly recommend the Harpa if you ever visit. For our first official meal, we went to Ramen Momo, a tiny little ramen cafe where everyone sits on stools that make up the perimeter of the restaurant. The food was soooo yummy, but the ginger tea is what really made me happy. So, the food in Iceland is generally a bit pricy, especially this one restaurant in our hotel. It was called the Slippbarinn, and all of the food there was so good. My sister an I would always try to convince my mom to spend a lil $$ and bring us to get like a fun drink or dessert. After we had ramen we decided to head down the hall to the Slippbarinn and get a dessert waffle topped with chocolate mousse, ice cream, and more. The next day we went on a bus tour around the country!!! One of the things Iceland is famous for, other than their water, is their chocolate!! Personally, my favorite kind was this OmNom caramel one. It had little crunchy nuggets of caramel on the bottom, and was probably the best chocolate I have ever had. That night after a long day of being tourists, my family and I did not really feel like walking out to dinner, so we convinced my mom to go to the Slippbarinn again!!! I got this burger that was so f*cking good. It was top with melted cheese, caramelized and pickled onions, lettuce, and some aioli. And of course I got some parmesan fries😋 Allergies who???? My sister on the other hand, was healthy and got a flatbread pizza salad. Sounds weird right?? The flatbread was topped with lettuce, goat cheese, pears, pomegranate seeds, and some hot peppers. Underage drinking? Nah lol. One of our other favorite things to get at the Slippbarinn was this drink that was a spin on lemonade. It was a bit like a lemonade mint mocktail. It was sooo yummy. Okay I’m going to be honest, I don’t know when we went to this restaurant. Icelandic Fish and Chips was the name of it, and we went twice because it was so good. I got just fried fish and potatoes, but the fish didn’t feel gross or oily. It was so fresh and delicious, and came with many aiolis. So, after the Blue Lagoon, my family and I walked around old Reykjavik, and we stopped at a restaurant, the name I am not quite sure of, I think it was “Fish and More'“, but it was right across from Café Babalu. I got fresh pollock with rice, broccoli, sweet potato, and some sauces. It was a very interesting, acquired taste. My sister got some THIC avocado toast at Fish and More. So the last day in Iceland, we went to the breakfast buffet at the hotel, and holy poop it was good. 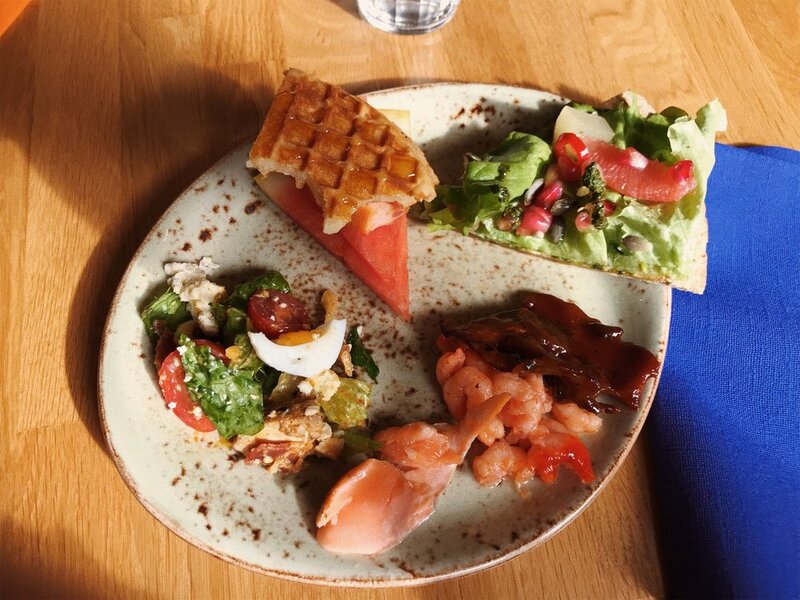 I had a salad, some smokes salmon, mini shrimp (the best part), barbecue pork, the flatbread pizza my sister had previously, some fruit, and a weird waffle cake thing. It pretty much all quality food. Overall, Iceland’s food was probably the best food I’ve ever had. If u a foodie like me, I would so recommend visiting.